Gino and Mary Ruffolo want the Ontario Superior Court to throw Mayor Linda Jackson out of office. The Ruffolos allege the mayor breached the Municipal Conflict of Interest Act at a closed-door meeting of council in November, flexing her muscle in council’s decision to launch a $395,000 lawsuit against them for breaching a 2006 settlement. The suit was filed in Newmarket court on Dec. 27. Jackson, the Ruffolos allege, should not have participated in that meeting because she was before the court for legal action brought forward in June by Gino Ruffolo and Quintino Mastroguiseppe. “She’s not denying it,” Ruffolo said this week. “I haven’t read anywhere where she’s denied that she took part in any deliberations. In June, Mastroguiseppe and Ruffolo asked the court for an audit into Jackson’s campaign finances after city council put off making a decision on the request. The pair allege Jackson broke financial rules contained in the Municipal Elections Act more than 20 times. June 2006: The Ruffolos settle with the city in the wrongful dismissal suit. Settlement awards the couple $160,000 and requires them to leave city officials alone. June 2007: Gino Ruffolo and Quintino Mastroguiseppe appeal council’s delay in deciding whether to order a compliance audit on Mayor Linda Jackson’s campaign expenses. Court expected to render decision Jan. 22. 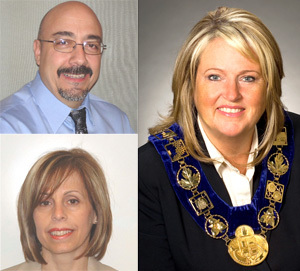 November 2007: The City of Vaughan launches $395,000 suit against the Ruffolos. The couple is alleged to have breached the terms agreed to in the June 2006 settlement. December 2007: During compliance audit hearing, Mayor Jackson’s lawyer advised that should an audit be ordered, Jackson could face removal from office. December 27, 2007: Court application filed by Ruffolos alleging Mayor Jackson is in a conflict of interest and seeking her remaval from office. Ontario Justice Lucia Favret’s decision on whether to order the compliance audit is expected on Jan. 22. The Ruffolos’ counter suit against Jackson may prove to be all the defence they need, however. If the suit against Jackson is successful, Gillespie explained, the basis of the city’s breach of settlement suit would come into question. The Ruffolos are seeking court costs and whatever other amount the court deems fair, in addition to wanting Jackson booted from the mayor’s chair. Though he did not specifically raise the possibility of vying for the potential vacancy, Gino Ruffolo did not back away from the suggestion. “Running for office is always a consideration in my household — for both me and my wife,” Ruffolo said. He was a mayoral candidate in the 2006 municipal election but withdrew from the race before the vote. Wife Mary ran and lost in Ward 1. A judge is expected to hear the Ruffolos’ case on Feb. 28.